100 students with their teachers (grades 4 to 8) from all over Ontario came to York University for their annual celebration of History from June 9-11, 2017. For the first time, York University (LA&PS History Department and the Archives of Ontario) hosted this event organized by the Ontario Heritage Fairs Association- l'Association des fêtes du patrimoine de l'Ontario. Students displayed their posters on various Canadian History topics, and the general public attended the fair as well. Our own Anthiya Neasadurai was there with her project, representing not only Hudson but TDSB as well. On June 8th at Scarborough Civic Center TDSB launched Urban Voices 2017, its annual publication of students' art and poetry work. Hudson students Shevin Baul and Contessa Kapsalis were selected from more than 2500 submissions to be featured in this year's edition. Annual Talent Show was a great success. All twenty three numbers that were presented received standing ovations. Special thanks goes to all talented participants, stage crew, and the teachers who made the event possible. Henry Hudson Grade 7 Boys' Soccer Team is the best one in the East Conference! The boys fought their way to the champion title yesterday at the TDESAA tournament where they went undefeated. Congratulations to the team, and the coaches: Ms. Law, Ms. ZIvadinovic and Mr. Chamberlain. We wish you the best of luck at City Finals on June 14th. Cricket Tournament was played at L'Amoreaux Cricket Ground on Friday, June 2nd. We won three games in a row with superb performance from every player. However, we lost in the final, so we could not go to the next round. 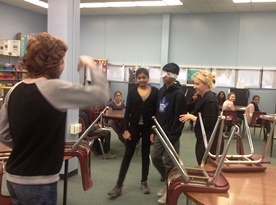 About 160 students and staff visited Pearson CI to view "The Forgetful Elephant", the play written and produced by a former Hudson student that won an award at this year's Sears Drama Festival. The performance addresses one family's coping with the issue of mental illness. Be Brave,Kind, Strong = Be Yourself! Be Brave, Kind, Strong = the Best You! Henry Hudson students had an absolutely wonderful day at Ripley's Aquarium learning about the importance of water conservation, various types of sea animals through a scavenger hunt, and textures of animals at various hands-on stations. Thank you Ms. Mason for the organization and opportunity. Awesome Hudson. It was a magical afternoon! 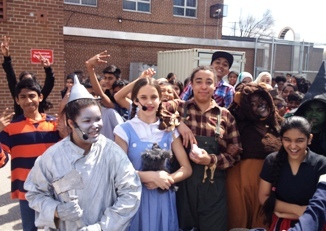 The students and staff walked to Ben Heppner Vocal Academy to enjoy "Wizard of Oz" performance. The show was an amazing and enjoyable display of talent and commitment. Learning Network 15 hosted TDSB Talks - English Speech Arts Contest today at the University of Toronto, Scarborough Campus. The Intermediate category featured 9 participants. The judges recognized the quality of the presentation by Maryam Zaki, who represented Hudson. She was awarded second place for the delivery of her speech on the topic of the dangers of technology. Well done! Grade 8 students displayed their historica inquiry based projects at our annual Heritage Fair school exhibit. The purpose of the fair is to bring awareness and interest in Canadian history to our students. After months of hard work and dedication, here they are. Particular projects selected by teachers will represent Henry Hudson at the Toronto East Regional Fair at Scarborough Civic Center on Thursday May 4. Stay tune for more details. Grade 7 students visited Fort York National Historic Site in downtown Toronto on April 20th. Despite the rain, the students and their teachers enjoyed learning about the war of 1812, military fortifications, soldiers' life, and other related topics. On April 12, 2017, Hudson 7/8L and HSP students showcased their invention project. Absolutely amazing job in selling their products to the public. Very proud of "Helmet Jam", "Drip Cone", & "You Go". All students at Henry Hudson are engaged in producing their own inquiry based project on a topic of their choice. They are working hard towards the final projects that will be on display on April 24th and 26th. leading to the School Heritage Fair scheduled for April 27th. Our new set of Chromebooks are in their cart and ready for use in classrooms. Big Thank you to Mr. Feng for leading our technology team and getting them ready for use. Grade 8 students had the opportunity and privilege to host Junior Achievement today and to learn about "Economics for Success". The guest presenters from Royal Bank of Canada engaged students and staff in different collaborative activities to practice earning, saving,and investing money. Students in classes 7A and 7C hosted Spinclusion today - a fun, interactive game that promotes anti-bullying, acceptance and respect of people with different needs, abilities and cultures. A game that celebrates differences and includes everyone was presented by the Community Living Toronto. March 10th was a wonderful Friday for grade 7 students and their teachers to roam through the Royal Ontario Museum. All students participated in the guided workshop on the topic of monotheistic religions, their origins, similarities and differences. They also examined the artifacts associated with each of the religions. Henry Hudson grade 7 students and teachers were among 7809 TDSB students who attended Marlies game vs Syracuse on February 22nd as a part of annual initiative sponsored by Toronto Foundation for Student Success. This event promotes physical activity and mental health and wellness withing TDSB. Thank you filmmaker Rob Stewart for educating the students at Henry Hudson the importance of saving marine animals and our planet. Classes 7A, 7B, 7C, 8F and 8G hosted a presentation by Career Connections Institute on November 17th in our school library. The guest speaker, Ms.Claudia Nembhard from Global Quality Assurance introduced students and staff to the variety of career choices available in this industry. On January 24, 2017, 80 Hudson students participated in a fun full day skiing excursion at Brimacombe Ski Resort in Oshawa. Our students had lots of fun as they learned the basics from their lessons, up the ski lift chairs, hit the slopes, and a few goodies of poutines and hot chocolates. Overall we had an amazing time through this wonderful experience. Well done Hudson. Vimy Oak "Pie In The Face"
Using nature as our inspiration while investigating on a trail, our students from 7/8M&L explored and learned about various elements of art and principles of design using cameras as their creative tool. And of course our students also had a bit of fun with tobogganing and a taste of roasted marshmallows. On December 14th all grade 7 student sand their teachers visited Ontario Science Center. The students participated in a hands-on workshop "Actions in Earth" before exploring the exhibit halls in small groups. It was a fun day, filled with science. On Saturday December 17, our students went to Woburn to compete in the 2016 Lego League Challenge. We took 17 students to show off their robotics skills. Our team was honoured to receive the Mechanical Design Award. The students had a lot of fun solving the challenges. Thank you to Mrs. Abdel Nour and Mr. Pandya for their time with this worthwhile club! TDSB Hour of Code supports a global movement to raise the awareness of the benefits of learning computer coding in elementary and secondary schools. Students in classes 7A and 7C had the opportunity to experiment with their coding skills. It was great to see the high level of engagement as well as the cooperation among our students. On Thursday November 24 we hosted a presenter from Covenant House to speak about a range of important topics called Before You Run. It was a customized, age-appropriate presentation that covers a broad range of youth risks. It explained how the circumstances that lead young people to the street are as varied as the youth themselves. It discussed how the experiences of family breakdown, abuse, mental health, bullying, drugs and stress can act as contributing factors to youth homelessness. The presentation included a video featuring Covenant House youth relating their real-life experiences in a non-threatening way. Students were given information and resources to help them make better choices and were reminded of their option here at school when they need someone to talk with. 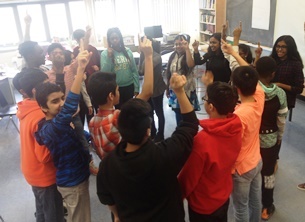 Classes 7A, 7B, 7C, 8F and 8G hosted a presentation by Career Connections Institute on November 17th in our school library. The guest speaker, Claudia Nembhard from Global Quality Assurance introduced students and staff to the variety of career choices available in this industry. We had a lot of fun on Hallow'en with many students dressing up but we also got involved in some social action. Our Me to We club had a bake sale to raise money to Scare Hunger! They raised around $500 for the cause. Way to go Hudson! When you are in our building, please notice our newly refinished and painted gym, our new grade 7 lockers and the freshly painted library with its new blinds and big overhead screen. Congratulations to the 2016 Henry Hudson Sr. P.S. Grade 8 graduates. Anjali & Ms. Morrow's spectacular dance performance at the Music & Theatre Night. On June 17th, the Henry Hudson Track & Field Team participated in the 2016 TDESAA Track & Field Meet at Birchmount Park. It was a hot and humid day but our students persevered and competed exceptionally well. Congratulations Hudson. Henry Hudson Sr. PS and Meadowvale PS participated in an outstanding 4-days/3-nights tour of Quebec City from May 31, 2016 to June 3, 2016. All students experienced French as a living, breathing language as they walked the streets of historic Old Quebec. 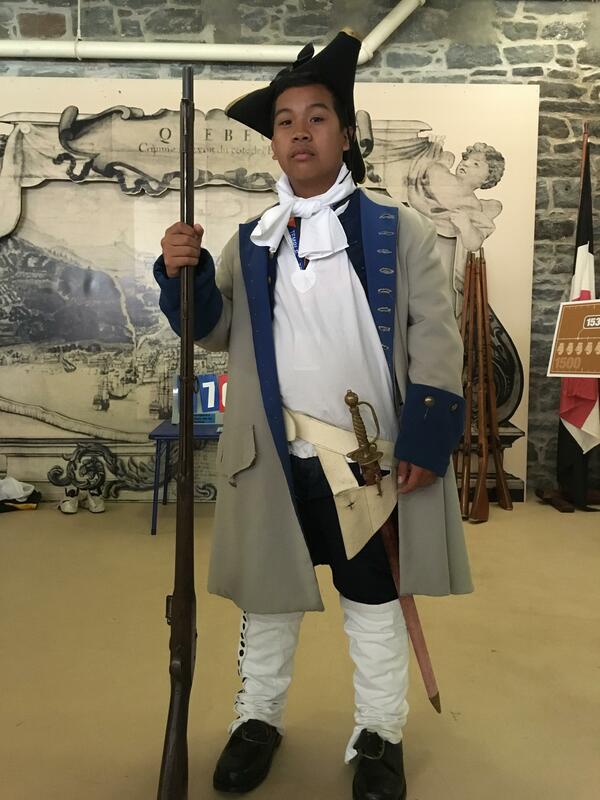 New France, The Seven Years War, and French-Canadian culture, all came to life as students visited museums, historic sites, and participated in cultural activities. LJ as a French soldier at the costume workshop at Artillery Park. Celebration student dance at the Palace Royal!!!! 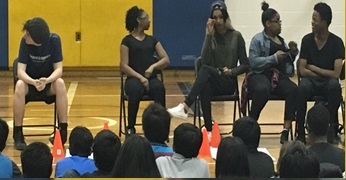 On Wed., June 1st the 2016 Arts in Education Co-op Company visited Henry Hudson Senior PS in Scarborough to present their original play #TheRealMe. Both a comedic and moving piece, this play looks at social media, mental health, racism, indigeneity, and homophobia. 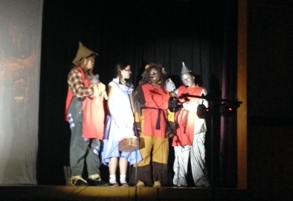 Students and staff enjoyed the performance that in many ways supports their Safe Schools initiatives. Henry Hudson Lego Robotics Team in action at Digital Citizenship night. Thibicka Thevan and Shylaja Kumarasingham (7D) were recognized by the Ontario Human Rights Commission Regional Heritage Fair that included 273 projects and more than 300 participants. Ontario Human Rights Commission presented them with the Award in recognition of their achievement in the research and preparation of a Heritage Fair Project about the history of women rights in Ontario. Well done! 2015 Hudson Choir Studio Recording "Give Us Hope"